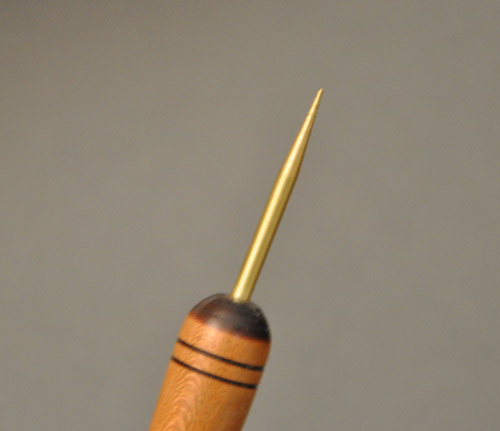 The Ball Tip Stiletto is a new tool for quilters. It has the typical wooden handle that I have for my No Roll Seam Ripper and Poke 'n Pull but the business end is a metal rod that is tapered but has a ball tip at the point. The beauty of this tool is that the tip is not sharp so it will not cut threads when it is dragged over the surface. It is very useful with paper piecing in that it will allow you to scrap away the paper without tearing the fabric. "As a longarmer, when the bobbin thread runs out and I have to unsew the last few stitches because of questionable tension, I used to use a stiletto. This posed a challenge to get under the stitch without piercing the fabric. Now there is a better way. Fred has a stiletto but with a blunt end like a little ball. It gets under stitches without piercing the fabric. I love it."